The most BRUTAL fanedit ever!!! This focuses Metalocalypse Season One on the government conspiracy angle. Now we don’t see all of the goings on in Mordhaus. It’s presented as a government reel of footage might be compiled. To focus on the government conspiracy angle of Metalocalypse. Now we don’t see all of the goings on in Mordhaus. We see some of what the spies see and we see what the public sees. Some footage around Mordhaus is used but we call that “surveillance” footage. It’s presented as a government reel of footage might be compiled. I hope you like it, I thought it was a cool idea but I’ve been wrong before. For so long now I’ve been bored to tears with the state of the music scene. It’s all either 14 year old girls who hope to be Madonna someday or these wusses who wish they could rock out. 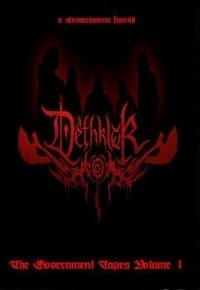 Then I heard Dethklok!!! Putting the power of their hate squarely in their music. BRUTAL METAL at it’s finest. This is music that I can get up and hate my coworkers to. + Cut scenes of the band at home. + Edited the word videooooooooooooooooooooooooooooooooooooooooooooo. + Added new captions describing footage.